1, Regardless of generation and concerns, we invite all of you interested in the information that can be found in this website to send us a feedback. 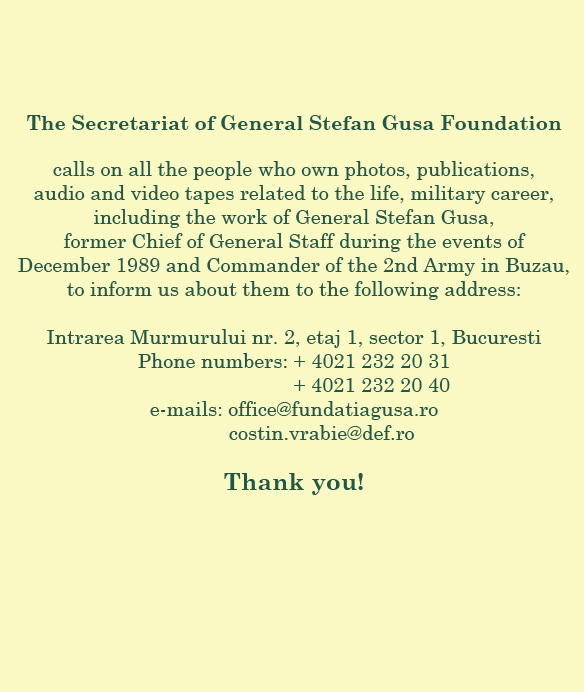 Also, those of you who wish to share personal memories with and about Stefan Gusa are invited to write us. Click on image 1 to view email address. 2, We are convinced that there are still some Romanian people who have the courage to share their personal opinions about some disputed topics such as December 1989, but not only that. Click on image 2 to view email address. Considering that the Program of the Foundation is planned one year before, we invite all those people interested in our projects to make allowance for this information and contact us in advance in order to come to an agreement concerning our future collaboration. Click on image 3 to view email address. We created this page because we wish to get some feedback from our visitor and to give you the opportunity to write us your commentaries. (How do you find the information on this website? Are there any information we might have forgotten and we should add to the content? What is your opinion about the structure and layout? Do you have any suggestions about how to improve this website?) Click on image 4 to view email address.